March 28, 2014—Although developing countries face enormous challenges in their fight against poverty, the only way they can become advanced economies is by having their workers get into manufacturing. “Economic history has shown us that with very few exceptions, developing countries cannot advance without first getting into low-end manufacturing. It’s inevitable in the beginning,” says Hinh Dinh, lead economist in DEC’s Operations and Strategy Unit. Workers in low-skilled services, such as street-side vendors and restaurant employees, have few opportunities, are less productive, and have incomes that fluctuate from one day to the next. Those in resource-based industries like mining have few opportunities because these sectors create very few jobs. A factory job, on the other hand, provides for a regular income unaffected by seasonality, and cultivates a work ethic, while providing an opportunity to learn a trade. But the type of manufacturing matters, says Dinh. As opposed to heavy industries, low-income countries need to produce the humble goods we use every day in and around the house, such as processed foods and beverages, leather, wood and metal products, and apparel. Such “light” manufacturing requires a large pool of unskilled or low-skilled labor (in the millions), which developing countries have in abundance, along with low capital costs. It also requires well-known and readily available technology. As an economy develops, it graduates from product assembly in the early stages to higher value-added products, manufacturing a higher quality and wider variety of goods. In the process, it becomes more and more industrialized. In the early 20th century, for example, Japan produced textiles and garments but now produces a large variety of goods that are of high quality. As a result, its workers now command higher wages. “History has proven over and over again that only this approach works,” says Dinh. Does this mean then, that workers in today’s low-income countries, most of whom are in Africa, are destined to be stuck in low-value manufacturing? Even worse, will they work their entire lives in sweatshops? Dinh points out that over time, the period within which countries move up from low-income to higher income has become shorter and shorter. It took almost 100 years for Europe and the US to become advanced economies. Japan took about 60 years; Korea and Taiwan took about 40 years each. With globalization and the arrival of technologies like the Internet, African countries could become advanced economies in under 30 years. Although taking issue with the term “sweatshop,” Dinh concedes that for the short-term, factory work remains the answer. People feel like they have better prospects for the long run in this type of manufacturing than if they were working somewhere else. Vietnam and Ethiopia are currently undergoing a boom in producing these kinds of goods. Though the two countries are similar in size and population—Vietnam is further ahead, and so points a way for Ethiopia. In 2009, whereas Ethiopia had 8,000 workers employed in the leather industry, and produced $8 million in exports, Vietnam employed 600,000 people, and had exports worth $3.5 billion (which has now grown to $10 billion). Ethiopia could do the same. For those who know their economic history, this focus on manufacturing has more than a whiff of “industrial policy.” Industrial policy is the process by which governments attempt to pick and support industries and players they believe to be “winners.” The result is often disastrous. A large number of country studies (six books covering Ethiopia, Tanzania, Zambia, China, Vietnam and Africa as a whole) produced by Dinh, in collaboration with colleagues from across the Bank and client governments, demonstrate that close cooperation between government and the private sector is key to successful industrialization—but the cooperation must be of a particular kind. The private sector needs to first successfully identify sectors organically, and then government needs to back it up by removing the binding constraints where necessary. One such constraint could be lack of electricity. If a government wants to provide electricity, advises Dinh, it should do so first in the areas where a cluster of manufacturing firms has already sprouted, and then move on to less dense areas. So, what are the implications for the Bank in terms of its advice to governments? “Rather than tell countries to do everything, the Bank should help countries identify the binding constraints that need to be removed in specific, viable industries. This will unleash growth,” says Dinh. 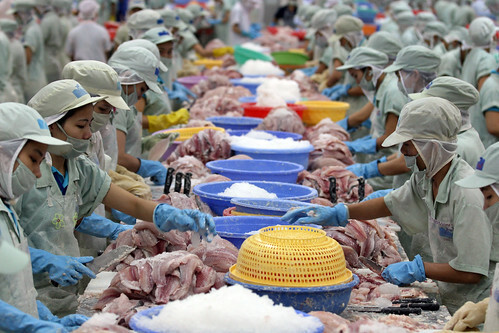 Dinh also adds that industrialization efforts must be accompanied by solid safety and environmental standards, because the long-term social and economic costs of a degrading work environment are significant. One only needs to look at the tragic fires in Bangladesh’s garment factories last year, which has resulted in foreign clothing companies moving away to other countries. Trang Nguyen is a Senior Economist in Poverty Reduction and Economic Management, the World Bank. Over the past 5 to 10 years, many East Asian countries, not just China, continued to reduce poverty despite an economic growth slowdown surrounding the 2008-2009 global financial crisis. The $1.25 a day poverty rate in developing East Asia and Pacific (EAP) declined from 17.1 percent in 2005 to 12.5 percent in 2010. Which factor played the biggest role in the further progress against poverty? A likely assumption would be increased labor income, given that social policies in EAP are far less generous than in regions like Latin America and Eastern Europe and Central Asia. In an effort to better understand EAP’s poverty dynamics, we recently studied 6 countries (Cambodia, Mongolia, Philippines, Thailand, Timor-Leste, and Vietnam) using data from the mid-to late-2000s. Our findings suggest that access to work and better earnings are essential — results that echo those of another recent World Bank study, which looked at 16 countries of different regions (for EAP, only Thailand) where there had been a substantial drop in poverty over the past decade (for more details, see “Jobs Boost Poverty Reduction”). • Labor income. Consistent with emerging evidence in other parts of the world, better jobs are the biggest force at work to reduce poverty. In all but one of the countries with data for the analysis (the Philippines), income from work (the sum of contributions from wage, farm, non-farm work, and the employment effect — that is, share of adults that are working) explains more than 40 percent of the observed changes in poverty (see figure below). In Vietnam and Cambodia, in particular, higher labor income explains more than 70 percent. In Timor-Leste, the loss of labor income between 2001 and 2007, covering a period of civil conflicts, explains almost all of the increase in poverty. • Non-labor income. This factor (the sum of income from assets, private remittances, public social assistance or insurance, and other transfers) was a big help in some countries. In Mongolia, increases in social transfers constituted an increasing fraction of the income of the poorest, consistent with the large contribution of non-labor income to poverty reduction. Similarly, in Thailand, non-labor incomes were quite important, with the share of transfers in aggregate incomes nearly doubling during the time period. • Demographic change. This factor (share of adults in the households) — which reflects birthrate declines some years ago and falling dependency rates (that is, a higher proportion of employable adults among all household members) — has made it easier to increase income and consumption per person in some of the countries, especially the Philippines. Source: World Bank 2014 (forthcoming). East Asia Pacific At Work: Employment, Enterprise, and Well-being. Notes: (1) Components below the zero line represent the factors whose changes contributed to a fall in the poverty rate (negative percents) whereas components above the zero line represent the factors whose changes contributed to a rise in the poverty rate. (2) Share of adults is number of adults divided by household size. (3) Share of working adults is number of employed divided by working-age people. (4) Poverty is measured as the fraction of the population with per-capita income of less than $1.25 a day for all the countries except for Thailand, where it is measured using the $2.50 poverty line. Changes in poverty were calculated for the following periods: Cambodia (2007, 2010), Thailand (2006, 2009), Philippines (2006, 2009), Vietnam (2004, 2010), Mongolia (2007, 2011), and Timor-Leste (2001, 2007). Which of these types of labor income helped or hindered the fight against poverty? The answer varies among the countries. In the 1980s and 1990s, work in agriculture was a key driver of poverty reduction. But more recently, wage income has played a bigger role. In fact, it explains roughly 50 percent of the observed decline in poverty in Vietnam, the Philippines, and Cambodia – and even more so in Mongolia. At the same time, the loss of real farm incomes during this period set back efforts to reduce poverty in Cambodia, Mongolia, and the Philippines, although the wage income increases managed to more than offset those falls. 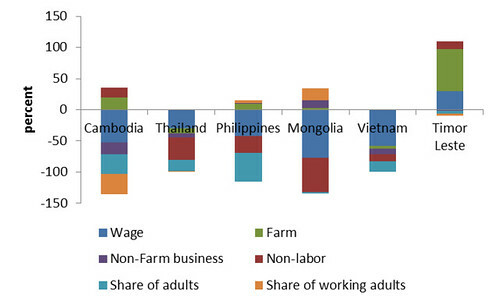 Poor households in Cambodia and the Philippines experienced a reduction in the share of agriculture income in total income over the period 2006-2009. From 2007 to 2011 in Mongolia, agricultural production suffered substantial losses owing to severe weather conditions. This entry was posted on Sunday, March 30th, 2014 at 9:10 pm and is filed under Bạn đọc viết. You can follow any responses to this entry through the RSS 2.0 feed. Both comments and pings are currently closed.